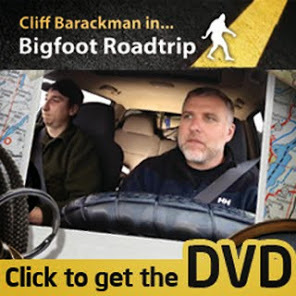 Back in July, a group of bigfoot researchers and I went on an expedition to Bluff Creek, CA. The high point of the trip was an amazing wood-knocking event that lasted over six minutes and was recorded and posted on my website. I saw this wood-knocking event as data to support my hypothesis that sasquatches often clap their hands to create the popping noises that are sometimes heard in their vicinity and often described as "wood-knocking". Being an amateur scientist, I am always looking for data to support my ideas, and these knocks fit the bill. A few weeks ago, I was contacted by a friend and bigfoot researcher who I have a tremendous amount of respect for, and she suggested that the popping noises could have been deer vocalizations. Though I thought it unlikely, I opened my mind to the possibility. The researcher also sent me a link to a recording of a white-tail deer making huffs, though the deer doing the huffing was not visually observed, just recorded. I started discussing this possibility with my peers, and I found some resistance to the idea, but the recordings made everyone involved open their minds to the possibility. Soon, another researcher sent me the following video of a deer making these same noises. After hearing the deer recording and comparing it to the recording we obtained at Bluff Creek, I am now of the opinion that we recorded a deer, not a sasquatch. The valley we were in has excellent acoustics, and there was some reverberation happening that distorted the sounds slightly, but I am pretty certain of the deer identification. This now brings up several interesting points I'd like to briefly discuss. First of all, this does not mean that sasquatches do not clap. It simply means that this recording cannot be used as data to support my hypothesis. There is still data to support it, such as a second-hand report of a visual observation of a clapping bigfoot from Klamath, CA, and another witness I personally spoke to who saw one clapping near Molalla, OR. There is also the nagging question as to how bigfoots can answer my own knocks so quickly, even though it takes significant time to find proper sticks and trees for knocking. Knowing that other apes use clapping as a form of communication, it is still likely (in my opinion) that clapping bigfoots is the answer. Wondering about wood-knocking in general, I asked this PhD (who is interested in the bigfoot topic and aware of research methods) if deer are known to answer knocks, and the answer was "not to my knowledge". I have had knocks answered in the same number and rhythm as the ones I did myself. It seems unlikely that deer would exhibit this behavior. Only humans, or hypothetically bigfoots, would do this. The last point I'd like to make about the changing of my mind on these recordings is an important one, and one that I think we should embrace more as amateur scientists: It is okay to be wrong. Yes, that's right, it's totally acceptable to be wrong about stuff. Being wrong about something like this does not mean that sasquatches do not exist. They do. It does not mean that one has been humiliated (drop the ego and we'll all be better off!). It means one has learned something. It does not mean that one is a bad researcher. It means that one is a good researcher. Scientists (amateur or professional) need to look at the data available and modify hypotheses accordingly. False leads often bring about new discoveries. Even after fifteen years in the woods specifically looking for and collecting sasquatch data, I feel like I still don't know much. Really, if we're honest with ourselves, none of us do. Sure, I have some hunches about what might be going on, but knowing is an entirely different thing.